Enjoy the pleasures of country living … at our quiet family campground! Camping includes grilled cheese. It just does, every time. 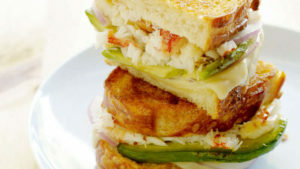 And grilled cheese is one of those crowd pleasers you can depend on. Everyone from the oldest to the youngest tends to enjoy it, it’s easy to make, and requires little clean up. You can branch out a little, though, and try some new twists on that old favorite. Bacon, Spinach, Tomatoes, and Fried Eggs – This little beauty is rich and buttery, tangy and tasty. You can make it with coarsely shredded smoked gouda, crisp bacon, baby spinach, garden fresh tomatoes, and fried eggs. It will stack well and the egg yolk will flow down the edge of your sandwich making it soooo tempting you’ll have a hard time waiting to bite in. Roast Beef and Two-Chile Grilled Cheese on Onion Rolls – This hearty grilled cheese will fill you up and warm you as well. You can moderate the heat by adjusting the green chile and chipotle mayo you add to it. Grilled Cheese with Artichokes, Tomato, and Black Olives – This Mediterranean flavored delight offers rich flavors and a nice bite. You decide what bread to put it on but something with garlic would be nice. There are so many ways you can dress up a grilled cheese when you’re camping. Try adding some of the leftover veggies from a previous meal. The tender-crisp crunch you’ll experience amidst the creamy, cheesy goodness will please your palette and is added nutrition as well. We hope all your camping meals are wonderful and your table is full with friends and family. We look forward to seeing you here this summer so be sure to say hello when you see us around the campground. Copyright © 2017-2019 — Holiday Camping Resort • All Rights Reserved.